Worcester County Sheriff Lewis Evangelidis has announced the graduation of Basic Recruit Training Academy. The class is made up of 14 new correctional officers, including four members who are military or still-serving reservists in the United States Army, U.S. Marine Corps, and Army National Guard. “Corrections is a serious business, with almost 90% of our inmate population incarcerated due to addiction issues our primary responsibility is to serve and protect the citizens of Worcester County. To do that effectively we must work daily with our inmate population so they are less likely to re-offend upon their release. I am proud to welcome our latest graduating class of fourteen new correctional officers who have met the challenges presented to them over the last twelve weeks. With many of our new officers having served their country and all of them committed to mission of public safety, they will surely make us a better department.” said Evangelidis. 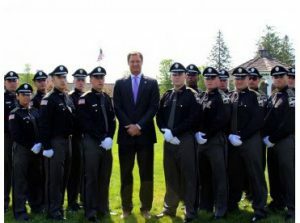 Among the graduating class of new correctional officers are three Worcester residents. Officer Dylan Forss, Officer Spiridon Perdikomatis and Officer Ilia Tanto. Forss was also the recipient of the Francis T. Foley Award for the highest academic grade point average and the Paul J. Westberg Banner Award. The Westberg award is given to the recruit who exemplifies the most effort and enthusiasm during the twelve week Academy.